« The perfect hair tie. It’s that time of year again. That time of year where it’s cold outside, heat is turned up high inside. We go out into the world bundled up, to walk into an overheated store, and our bodies just don’t know how to regulate it all. Our skin and lips become very dry. People lotion/moisturize the heck out themselves but most people forget their poor, delicate scalp. What people seem NOT to be aware of is that our scalp is an extension of our face. We would never do to our faces what we do to our scalps, i.e. drying soaps, no moisturizer, harsh chemical, etcetera. I always tell my clients, a healthy scalp equals healthy hair. What’s my secret to a healthy scalp? It is Rene Furterer Astera Soothing Fluid. 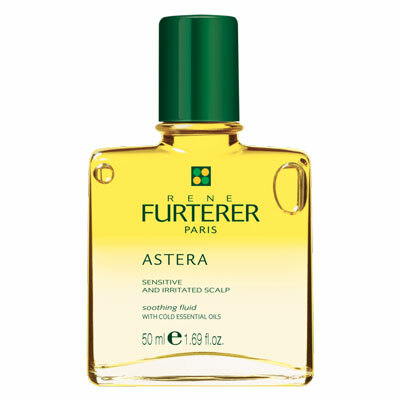 I have used Rene Furterer Astera Soothing Fluid on my scalp, on and off, since the late 90’s. Rene Furterer Astera Soothing Fluid Is an amazing, light weight, easy to use treatment. All you have to do is apply it to your scalp a minimum of 20 minutes before you wash your hair. It has a pointed tip so it’s easy to apply, just open the bottle, run the tip along your scalp (on the slower side) and massage it in. I work in a 3 inch sections, where I run the tip against the scalp applying the serum, and then massage it in with the balls my fingers. Smaller sections is the trick, because your hair will absorb the serum if you don’t get to it fast enough. After I apply the whole head, I go through and massage my whole scalp. Massaging the scalp stimulates blood flow which helps the scalp repair itself. I usually put on Rene Furterer Astera Soothing Fluid at night and sleep with it in. Sure, it’s a little overkill but that’s how I do.